Students at Roger Bacon Academy competed virtually with archery teams across the state Monday. Archery is one of the fastest growing sports among students. It takes the right kind of stance, equipment, patience and persistence to become a competitive athlete in archery. “It gives every child a chance to participate in something that you don’t have to be a world class athlete to participate in,” said Kevin Crabtree with NC Wildlife. The co-ed team at Roger Bacon Academy is only two-years-old and is already ranked 14th in the entire world. Not only are the student athletes hitting bull’s-eyes, they are hitting their targets in the classroom too. Their report cards are better because their focus on the field has created focus in the classroom. “I can walk away with my head held high because I’m teaching these kids something they can have for the rest of their life,” said Coach TJ Beamer. 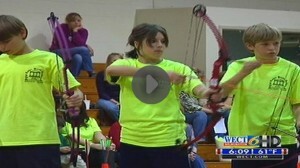 The National Archery in Schools program is run through the NC Wildlife Division. Roger Bacon Academy is waiting on all of its scores from Monday’s qualifying tournament, but rumor has it all 24 middle school archers are heading to nationals.